Free Printable Planner 2019: Top 40 Brilliant Planners and Calendars! Looking for a free printable planner 2019 to get started with the new year? 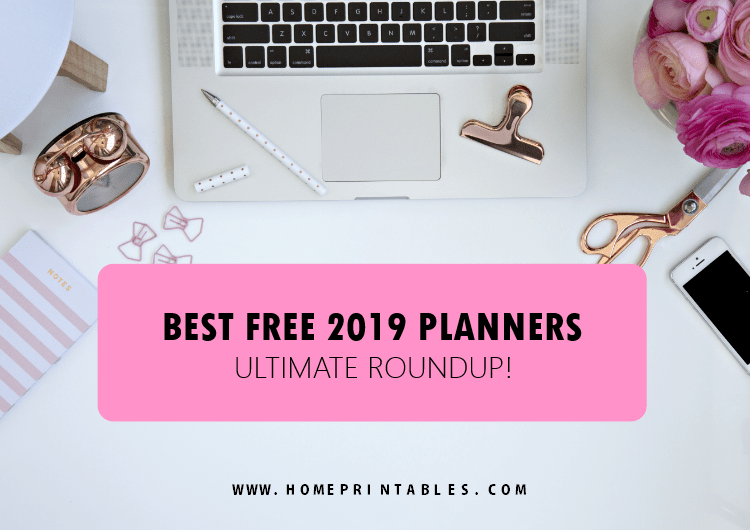 We have rounded up 40 amazing free 2019 planners and calendars for you! These planners are carefully handpicked, guaranteed! We only included the most beautiful, functional and brilliant ones we created and found online! So if you’re still scouring the net looking for one, this list is a great starting point for that perfect free 2019 planner! We’re super thrilled to roll out what made it to our Top 40! It’s the time of the year! We clearly know how much you need a good planner by this time. We know how much it can help you kickstart a great year to help you stay organized and be very productive ll through out. This is why, we gathered the most brilliant ones online! We’re lucky because there are tons of free planners available. All we need is home printer and we’re good to make our own planner at home. But hopping allover the web hunting for the perfect free printable planner 2019 can be time consuming, isn’t it? This is why, we came up with a roundup post to ease you. Yup, it’s here again! The 2019 edition of Top 40 Free Printable Planners! Last year’s roundup was massive success and it was enjoyed by several of you. We hope that this list will again help thousands of people allover the world find their planner! We have gathered 40 free printable planners (totaling to over 300 printable sheets!) from different blogs and websites. We’ve also included our very own designs! We can assure you that we have meticulously handpicked what made it to our top 40. OUR TOP 40 LIST OF FREE PRINTABLE PLANNER 2019 : CAREFULLY HANDPICKED MASTERPIECES FOR YOU! Check out the life planners, budget binders, student planners, teacher planners, blog planners, monthly calendars, editable calendars and more in the list! All these are carefully crafted masterpieces. That’s about it, friends! Our top 40 list of most amazing free printable planner 2019 online! I hope you find this list useful! And by the way, should you be looking for a premium 2019 planner to use that’s easy on the pocket, check out this amazing planner available at Shining Mom– The 2019 Success Designer Planner! This planner has 60 printable pages that are carefully designed and crafted to help you achieve your dreams, one step at a time. It’s an ultimate productivity planner for everyone! Have a blessed and prosperous 2019, friends! We hope you can help us spread the list by pinning this post at Pinterest!